Planning permission has been granted for the sensitive reuse of The Goods Shed, formerly associated with the Royal Mail site on Upper Clifton Road, Sutton Coldfield. The proposal involves the retention of this attractive and interesting building by converting it into a single family dwelling. 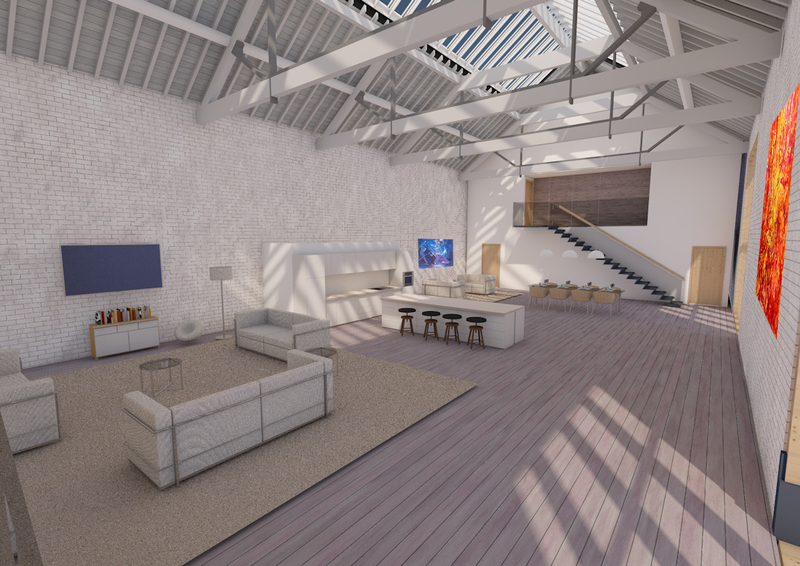 Many features of the Goods Shed will be retained including the timber canopies to the south elevation, the exposed roof trusses and the railway tracks that run through the building. The internal layout draws on the key characteristics of the existing building: at present it is one large open volume, with a separate office to the east. There is a large patent glazed roof light over the majority of the space, which naturally illuminates the central area. Our design maintains as much of the feeling of openness as possible by restricting built accommodation to two pods within either end of the building. These pods are located in the hipped ends of the roof, allowing the central space to be retained as a double height volume. Each pod is 2 storeys high and sits 150mm inside of the existing walls and roof. The pods contain the bedrooms – which are the most noise sensitive areas – and will be constructed from a timber frame with high levels of insulation for noise and thermal benefit. The pods are free standing structures within the wider volume of the building and are a change that could be fully removed in the future with limited impact on the listed fabric. The central space contains the main living, dining and kitchen areas, with a small single storey pod built in behind the main kitchen which contains store rooms/ pantry. Each bedroom pod is accessed from the central space by a steel staircase with glazed balustrade. This reduces the need to provide bridge links and a central stair in the main space, maintaining its sense of openness. Overall, the floor area will increase from 368 sqm up to 508 sqm. The Goods Shed was designed to lift coal from wagons within the shed and the original railway tracks still remain. It is proposed that these are left in-situ and bridged over, with large walk-on glass viewing windows cut into the floor to expose them in the main living space. The reveal will be lit with LEDs to illuminate the tracks below. It is proposed that the existing loading doors will be filled with purpose-made timber structural, double-glazed curtain walling. The existing train doors on the side elevation will also be glazed using the same structural timber curtain walling. The patent glazed roof lights will be replaced with a new double-glazed patent glazing system, keeping to the fenestration pattern. 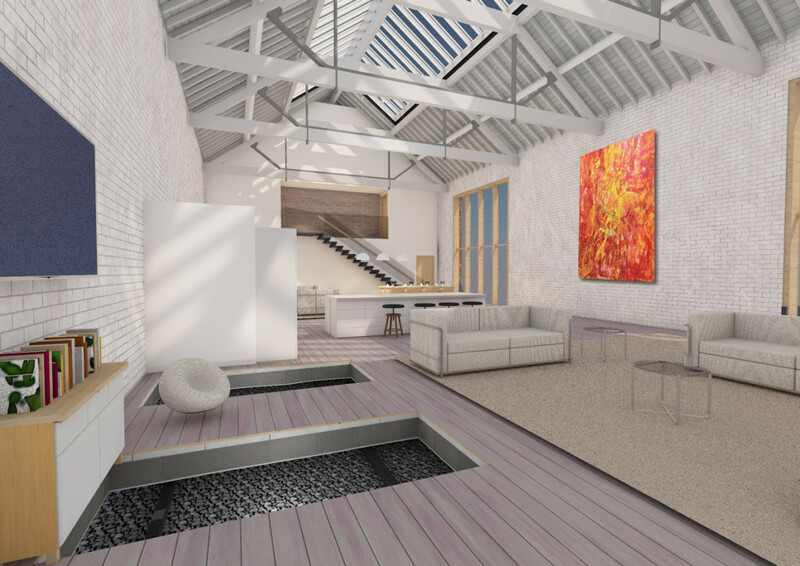 The hipped roofs, contemporary double-glazed roof lights are proposed which will sit flush with the roof tiles like a conservation roof light. The final intervention is to the side elevation, with the addition of a flush glazed window to ground and first floor. This is a contemporary intervention using an aluminium glazing system that allows the window to appear frameless from the outside. This provides light and ventilation to the ground and first floor bedrooms, as well as a view over the side garden. Careful consideration has been given to how to integrate a garden to the front of the property, whilst retaining a sense of openness in the street scene, as well as providing some privacy to occupiers. The frontage area is to be split roughly in half, with a paved driveway and a garden area which will be enclosed by a 1.5m high timber sleeper wall (a nod to the building’s past as a coal yard and builders merchants). The sleeper wall will add visual interest to the site, and low level shrubs will soften the boundary.